Smith Forging ｜ UTSUMI Co, Ltd.
"Chakkou Hizukuri" is a unique Japanese forge welding method that, it is said, was established in the Heian Era (794-1192) for making samurai swords. 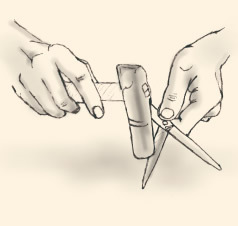 The manufacturing technique for making shears came from China to Japan in the Muromachi Era (1338-1573). Most of the cutlery in the world is made from hard steel, but Japanese cutleries are made with soft iron steel for the main body and hard steel, forge welded, for the cutting edge. This crafting method is called "Chakkou". The main stream of the Japanese cutleries using the manufacturing process "Chakkou" results in soft handling, sharp cutting, and hard to break characteristics. Steel has a characteristic of sharper cutting but less endurance when it is soft. If it is hard, it has longer endurance with less sharpness. "Chakkou" takes advantage of the good points of both soft and hard steels. For the barber/beauty salon shears, we pick the optimum steel materials and through heat treatment processes, such as annealing, quenching, and tempering, make a final product that is sharp and long lasting. Our mission in Utsumi Co., Ltd is to ensure the traditional manufacturing technique is kept alive by performing an annual, traditional, ritual in the Osaka plant and to continue making the hand crafted shears using only experienced craftsmen. Chimaki Utsumi, Utsumi Co., Ltd. Forge weld soft iron with hard steel edge. Hammer edge to the size.Sprinkle sodium tetraborate and iron powder on red hot soft iron. Put hard steel on top of it. Reheat red hot and then hammer them bonding. Cut off excess un-bonded portion. Tubushi Hammer out the handle to be part. Make a slit for the finger ring. Make finger ring slit round. Make edge part thinner for ease of later edge formation. Repeating the heat treatment process and hammering makes the steel molecules stable. Finish the finger ring and finger rest with a file. Finish the outside of the handle with file and grinder. Adjust width and thickness according to the specification. Make a pivot hole. Heat process gives steel tempering. Convex arc along hollow ground is essential for constant friction during cut. Removing distrortion and polishing to a fine finish. Apply edges to both side by using coarse and fine stones. Choshitori Assenble and check Balance by hand. Chakkou shears are completed through eighty steps.